I’ve been blogging in secret this week so I can show you some sneak peeks of the girls’ Christmas gifts. We often do at least one joint or family gift, and this year the girls are getting a beginner microscope. 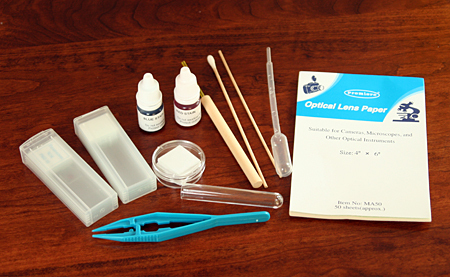 We are definitely ready to move beyond magnifying glasses around here. And, after spending a few minutes (secretly) playing with our new microscope, I am sure we are all going to have tons of fun using our microscope to explore all kinds of things! 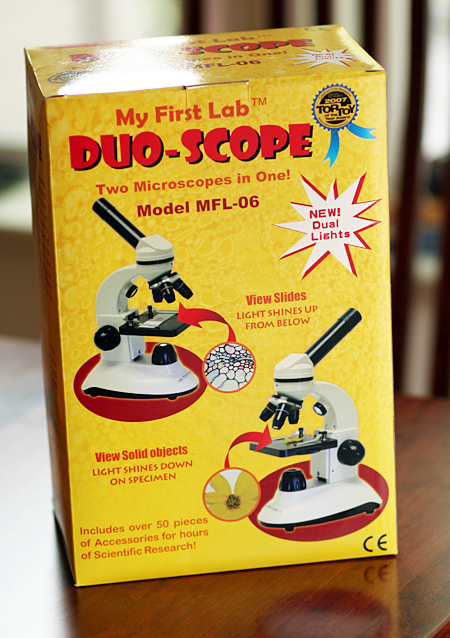 The My First Lab Duo-Scope Microscope is a great fit for what I was looking for. First of all, the microscope comes packaged in a fun yellow box, which is a nice touch for gift-giving. I was initially planning to unpack the scope from its box, but this box is too cute! -Dual light sources: Use the lower light to shine up and view slides or use the upper light to shine down on solid objects for viewing. There is a simple switch on the back of the microscope that turns on each of the LED lights independently. -Focusing knobs that are chunky and super-easy for kids to grip. I also found that the knobs operate very smoothly and it is easy to make small adjustments. –6-hole diaphragm for controlling the amount of light that reaches the stage. Ability to look at solid objects, like leaves, coins, rocks, and stamps – my dad and I had fun looking at the words and details on coins, so I know the girls are going to love being able to do that, too! 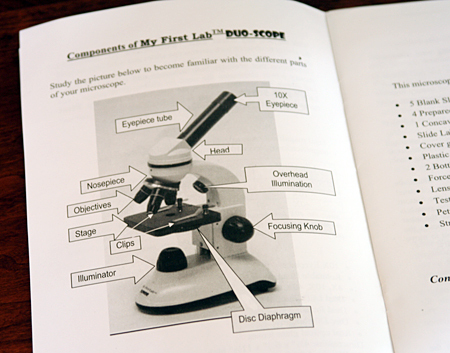 The Usborne Complete Book of the Microscope – It’s been a long time since I’ve used a microscope, so I thought a microscope book might be helpful. This book is amazing! 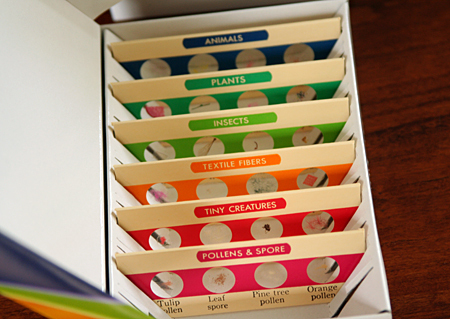 It is filled with colorful illustrations and photographs, plus tons of activities to do using a microscope. I’m sure this book will be a great resource to us for many years! Prepared Slides – I decided to start us off with a collection of prepared slides. I went with the Learning Resources Prepared Slides Combination Set. For beginners like us, these slides are a great place to start. I took a peek at them and the quality looks good. There are many excellent, detailed reviews of the My First Lab Duo-Scope Microscope on Amazon if you want to research this beginner microscope further. 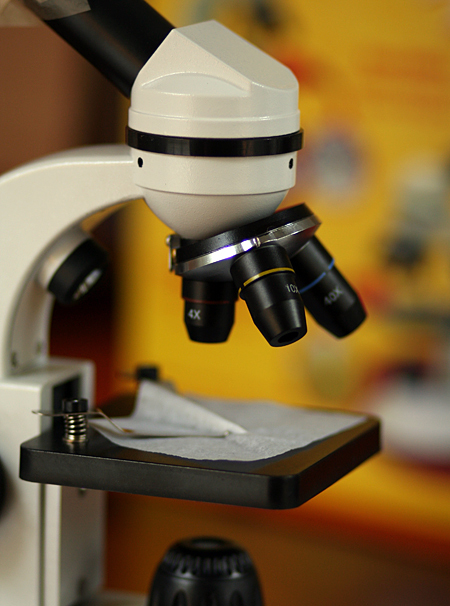 After Christmas, I’m sure I will be sharing some of our exciting microscope adventures! Disclosure: I researched, chose, and purchased this product on my own and am sharing it with you because I think its great! This post includes affiliate links – thanks for supporting Let’s Explore! I love this idea. I love your blog. And I must say, your home looks like a lovely place to grow up. Thanks for always sharing the fun stuff you are doing. Thanks for sharing this idea. It is defintely one I probably wouldn’t have thought of on my own, yet I think it will be the perfect gift for my little scientist. His wishlist is very slim and doesn’t have a ‘wow’ gift. I think this will fit the bill perfectly, especially since he has loved using them in his science class we took last month. 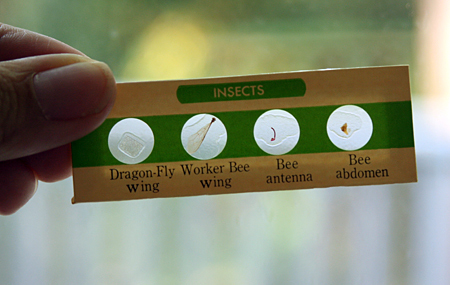 This is a great tool to teach science. But do you know what else it can teach? Writing, have the girls write what they see in the telescope. I bought a video scope for my special needs son and we looked at dirt, coffee grounds. Dirty things and germs. He would write on his computer about it in order to learn how to write better. Enjoyed your report on the Duo-Scope. Where can I find the instruction manual and helpful hints? we did not get to open the box until now, somehow the Manual book is in the box! Please help!!! Thanks Amy, we’ll check it out! Thanks so much again. I just got a copy of the manual. Looking forward to sharing fun experiences with my boys. Love the microscope idea. How old do you think they should be when they start using this? The manufacturer recommends 9-18 but if your younger child has sufficient interest and manual dexterity I imagine it would be fine for them.